Our Basic Clear Melt and Pour Soap Base has a clarity score of 9 out of 10. The 24 lb. big block is ideal for larger projects, as it will make (96) 4 oz. bars of soap. Soap comes in a blue bag with twist tie and corrugate box. A single block measures 13 x 11.5 x 6 inches. COMMENTS: This soap works wonderful as a melt & pour. It melts nicely remains clear making it easy to see through soap to what you put on the inside. IT doesn't bubble and hardens quick and evenly. "I HAVE NEVER SEEN SUCH BIG BUBBLES AT %5 RATIO"
COMMENTS: We are working in a high humidity area and this sweats less than other brands we have tried. It is clear and no fuss every single time. Consistently high quality. We have ordered many times. COMMENTS: Nice lather and holds fragrance well.Will be using this alot now. "Perfect for two tone soaps"
COMMENTS: I used this mainly for one of my soaps that I made look like ocean and waves with this soap colored blue, and had whipped white shea butter soap on top. "I used this up in one day with a large order." COMMENTS: Love this. Easy to work with, takes color well and looks beautiful in finished product. COMMENTS: I find that I can be the most artistic with this base! It is a wonderful product. COMMENTS: Great melt and pour base. Easy to use, holds fragrance well. "Works Great! No Sweat! " COMMENTS: Works nicely and does not sweat at all. Very easy to work with! COMMENTS: We use this base for all our basic soap bars. It melts evenly, doesn't dry out in storage and is easy to cut. i like being able to get it in various bulk sizes depending on our season and how busy we are. "Best for the price "
COMMENTS: This melt and pour is by far the best deal for the quality. Holds scent and color well and no sweat. "Basic clear 24 lb block"
• Clarity and amount of suds is superb. 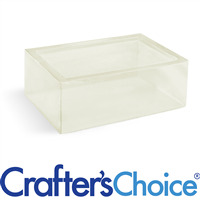 "Great for any project that you need to embed "
"Crafters Choice™ Basic Clear MP Soap Base - 24 lb." COMMENTS: I use this base to make layered soap. It holds the color well. Produces beautiful bars of soap. • How it holds the color. COMMENTS: My Go-To base for creative M&P designs. COMMENTS: I love being able to buy this in bulk. COMMENTS: We use this soap base for our childrens soap that we put toys in. It ia a great clear and well lathered soap. COMMENTS: This was my first experience with melt & pour! It does have a bit of a chemical-y smell, but it won't show once you add fragrance. I cut a small piece from the block and tried in small molds that I planned to use for embeds. It was very easy! Melt, pour, and use! The instructions that it came with said to put in a crock pot or double boiler system to melt the soap but 10 second bursts in the microwave is much faster. They do get hard rather quickly, so I just pop them back in the microwave for 10 seconds at a time when I put them in the mold. Mica shows up very beautifully in the soap and you can see its natural sparkle. I do recommend using the mini hand mixer (you can buy under tools) so that clumps don't show in the final product. the product sweats a little. "Basic Clear MP Soap Base - 24 lb. Block"
COMMENTS: Very clear for photo embed soap. Will purchase more. COMMENTS: I found this clear base so very easy to work with. It stayed slightly softer than some others but not enough to make a big difference to the finished bar. I will likely get this one again. COMMENTS: The site says this soap has a clarity of 9 out of 10 but I would rate it a 10 ! All the soaps I have made with embeds have been very clear and the soap lathers extremely well. Very happy with it. COMMENTS: not a low sweat, colored nice though. COMMENTS: I haven't found a clear melt and pour base that I have liked until this one. The others weren't as clear as I wanted and this one is amazing, and it takes color really well also. COMMENTS: Great MP Base. It stays clear. COMMENTS: This is my go to clear soap base. Easy to work with and easy to add fragrances and colors. I do wish I could purchase it already cut up! COMMENTS: I have never done MP soap. My usual is HP or CP. I was surprised by the level of skill required for this type of soaping. I of course am doing a very complicated project and have done many do-overs but the product is most forgiving and my soaps are just as I had envisioned. COMMENTS: I must say that my customers love this soap. It's great for embedding. "This is my favorite base!" COMMENTS: I use this base in just about every bar. Great for swirls or to make an opaque bar more translucent. COMMENTS: Easy to cut and very smooth and creamy. So easy to work with. COMMENTS: Love this soap. It has great clarity and my customers love the feel it. They tell me it leaves them moisturized and clean. The leather is good and it holds fragrance very well. COMMENTS: This soap is awesome. Very consistent results each time I use it. Gives great clarity to any color added. COMMENTS: I use WSP basic melt and pour for everything. COMMENTS: This base has great lather and low sweat. "Great for Solid Sugar Scrubs"
COMMENTS: I bought this as a first time user to start making sugar scrub cubes. This was so easy to melt in the microwave and I couldn't be happier! COMMENTS: so love this soap for the price it can not be beat easily removed from bag and cut into usable pieces. I add a little bit of this and that and it always comes out wonderfully. Have enjoyed loads of fun making different soaps w/ this - trying new things, etc. Very clear - clear enough to see embeds easily. Soap is gentle, bubbly, smooth. Fine quality product. Customers love the clear soaps w/ embeds and they sell well. Holds additives well, beneficial additives, colors and FOs blend easily. Will always order more of this to keep it on hand at all times. Thanks WSP! COMMENTS: I've been more than pleased with it. Expect to buy again from Wholesale Supplies. "Moisturizing base at a lower cost"
COMMENTS: This base is a nice alternative to the higher priced bases but still provides a nice bar of soap at a competitive price. The base takes color and scent well. It s less clear when it is removed from the mold. Cosmetic glitter although less pronounced in this base can still be used and provides a beautiful sparkle. COMMENTS: I bought this because it was a bit cheaper than buying the preweighed tubs of soap. The soap is very hard to try to cut, but if you have a lot of extra time, some strong arms, and a lot of patience it is worth it. "Wonderful but not 100% CRYSTAL Clear"
COMMENTS: This is great for non-opaque products, but it is not AS CLEAR as the NON DETERGENT-FREE base. I still like using this for most non-opaque items, but if the finished product needs to be crystal clear, this isn't the base I use. COMMENTS: This product is a wonderful base and holds colors well, it also has a great lather. The 24lb. Block was easy to cut! COMMENTS: By far my favorite clear melt and pour base. Perfect clarity for embeds. COMMENTS: Love this clear base. Works great with colorblocks. COMMENTS: I was skeptical to try this base but I'm so glad I did. It's easy to work with, lathers very well and customers love it. COMMENTS: I make fish-in-a-bag and loofah soap using this melt & pour base. It is the best quality soap base I have ever purchased. No sweat and no odor just perfect. COMMENTS: RE my first order-I blew though four 24 lb blocks of this like nothing. It is easy to cut, plenty clear, even clearer when melted, takes scent well, and colors really well. You can get some nice deep colors with the transparent bases. Great price and of course free shipping! What else is there?? "Works well, but not totally clear"
COMMENTS: This is a great base, but the signature is a better product if you need it really clear. "So clear I can read through 98th"
COMMENTS: This has become my top base to use. Its a great value. The performance is outstandingly and it's super easy to work with. My business is growing don't fix what isn't broken. • dont lose lather with additives! COMMENTS: I always order/use this base. It works just fine. "great to add depth to white base soaps"
COMMENTS: I don't make many all clear soaps. I like the white creamy look. I find a block of the clear great for adding character. I use it to make darker layers/chunks, swirl in a mica or layer a shimmery mica on top. COMMENTS: I love it! I use this primarily in my melt and pour soap workshop for kids and the quality is very clear and good. we use it to embed prizes and soap embeds. can be a bit "sticky" though- but excellent for price. COMMENTS: This is the first time using the Basic Clear MP and I was very surprised of the clarity and wow it cuts like butter. Melts beautifully and sets up nice in my 1501 loaf mold. Love the lather. It also takes additives well and I used Titanum Dioxide to make a white shea base and it worked wonderful. COMMENTS: Love the product we use this with our own soap formula and love your prices. "Basic clear melt and pour soap"
COMMENTS: This is an easy to use soap base. It cuts well, colors and fragrances well. I have enjoyed using it and the lathering and moisturizing properties make it a top seller. I use it in my loaf soaps and also in my foaming whipped sugar scrubs. "I can't get enough of this soap! :-)"
COMMENTS: This soap is so versatile. It is so clear and it takes color so well. (powders and liquids) It always comes through for me. It's great just as it is or when adding things to it like different types of oils, etc.. It's just a great soap all the way around. It's what got me hooked and brave enough to try all your other soaps. I buy it by the cases!LOL I would panic if I started running out! • It truly is clear. COMMENTS: Love this base. Takes color beautifully and doesn't sweat. "This is a must have for mp soap makers"
COMMENTS: My customers love this soap as it makes their skin nice and soft and never sweats on them! I love using it and it makes soaping fun and allows me to make designer soaps made from a high quality product! Will totally buy again! COMMENTS: When I want just basic clear soap, this is the one I reach for. It meets my needs everytime. "Very Nice Clear but not Crystal Clear"
COMMENTS: This soap is very easy to work with. Has no odor and takes color and fragrance well. It comes in a large plastic bag inside a box. I find it a bit difficult to cut, so I leave it in its box. I remove and cut it as needed, then tie it back up. It does not sweat. Lathers very nicely. Its not crystal clear but WSP does have a Crystal Clear option. COMMENTS: Great. We love using your M&P for all of our embeds. COMMENTS: Great for the price - a little softer than the others but I blend it with other bases to get more bang for the buck! "Basic M&P Clear is very good value"
COMMENTS: Any time you can get down to around $2/lb delivered is good value, and add in the great lather of this bar and it makes it an even better value. All of our customers love it as well. COMMENTS: This is my "go to" soap base. The best I have used. It is very clear and I know there is a crystal soap base but I can't imagine it being clearer than this. I used it to make gemstone soaps and it its perfect with mica colors and held its fragrance extremely well. "Basic MP Soap Base - Clear 24 lb. Block"
COMMENTS: Wonderful soap. Sort of hard to cut off the big block but for the price I don't care. Does sweat so wrap your soaps soon or expect a long sit down of rubbing the sweat beads off. COMMENTS: I love this clear melt and pour base..the 24lb block is a struggle to cut sometimes. But it colors well. I will continue to buy this brand. COMMENTS: Use this in my plastic molds. They don't stick! COMMENTS: I used this for my daughter's 6th birthday in the goody bags! We made Scooby soaps together. It has created a whole new market in my soaps. I will begin rolling out a kids line next week in addition to my cold and hot process soaps! • My 6 year old can do this with me! COMMENTS: used this base to make loofah rounds and it worked great. didnt sweat, was clear and took color & scent very well. COMMENTS: This soap is great!! Low sweat!! Very clear!!! "Great price and a great product." COMMENTS: This is our new favorite base. Easy to work with. Takes scent easily. Low shrinkage. Will order again and again. "Review of Basic Clear MP Base 24lbs"
COMMENTS: I would have to say that the base melted at low temps perfectly. There was no discoloration at all. It blended well with the colorants and fragrances that I was using well. I will be re-ordering this clear basic base again. This product was of very high quality. I also am a member of several soap pages and will be posting notes about the base along with my photos. COMMENTS: I'm on to my second batch of this soap, as I'm a beginner. This product is very consistent in its quality. Familiar with the product from a previous purchase, this purchase is exactly the same. Very clear, very low odor, easy to work with. Cools quickly and evenly, produces a very nice bar. Really like, and will buy again! 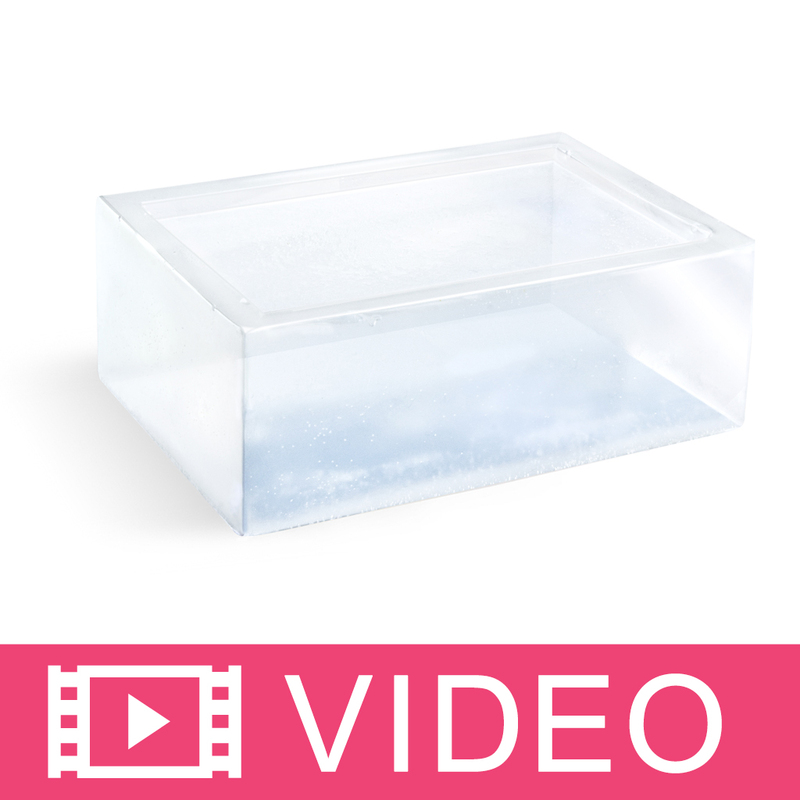 COMMENTS: Although this base looks yellow in the box, once melted down it is very clear. It looked wonderful when I mixed mica powder into it. Very easy to work with and it has a good lather to it. Excellent base for the budget soap maker! COMMENTS: makes a nice bar holds colors/fo nicely no extra odor to this melts nicely YOU NEED THIS! "Love this MP Soap Base"
COMMENTS: I love the quality of this soap base and you can't beat the price and free shipping! COMMENTS: This product is perfect for my melt & pour projects. Personally, I prefer to melt it in the microwave and it is so easy to pour into whatever mold I wish. COMMENTS: I have tried a few different companies for clear soap base and this seems to be the most consistent with quality. It cuts smooth, takes dyes well and has been fun to work with! "Great for making beautiful soaps"
COMMENTS: Not only is this a very nice soap base but I love making some very pretty soaps with this. It is true that using the sparkle color blocks in this clear base make some beautiful colors and soaps. A few of my customers don't like the butters and moisturizers. They want a simple soap so this works well. I just make it interesting with the color and fragrance additions. Great product. COMMENTS: Works great with my loofah soaps holds scent and color very well! COMMENTS: Of all the bases that I have used this is my favorite. It cuts smoothly and easily, melts evenly and holds scents until you have used every last bit of the bar! My customers are big fans as well! COMMENTS: I'm very happy with this clarity of this base. I use it for my goldfish-in-a-bag soap and it's crystal clear. Thanks! COMMENTS: comes in a big block which is perfect for me. Cut a chunk off and get ready to work! clear, and easy to play with! COMMENTS: I like this base because it is easy to use, makes good bubbles, colors goods, melts easily and my hands are not dried out from working with it.It's clear enough to use for embeds. COMMENTS: I love this base. I was buying base from another large soaping company, this one is a much higher quality. Very clear, low odor, melts very easily.It's very easy to cut. Definitely a permanent change of products for myself. COMMENTS: Buy in blocks for a better value. WSP soap base is 5 star always. COMMENTS: 24 lb block won't last as long as you think. This is a great base that's easy to work with and has great clarity. Excellent product for a great price! COMMENTS: I use this base to create my soaps, my customers and i love it! "Love this base ! " "Best for the best price"
COMMENTS: This was my first huge block of melt & pour soap. It has lasted a long time. I have used it to make many types of soap- from colorants, to embeds, to a few additives. It holds fragrances well, and it has a nice lather. I found no issues with this soap- I NEED MORE! No, 24 lbs is not enough! COMMENTS: My favorite soap base! Very clear, embeds look great in this soap. Easy to work with, melts down nicely and has no natural tint so colors look perfect every time. Holds fragrance well and doesn't sweat like many other bases do. COMMENTS: god quality melt and pour. COMMENTS: Perfect base! Its super clear, holds scent and color, and washes like a dream. I use it in my best seller! COMMENTS: I love this product! This base is really clear I am very impressed.. COMMENTS: This clear soap is awesome because it doesn't cloud up much like other bases, and it performs well at low temperatures. 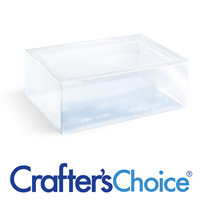 "Crafters Choice™ Basic MP Soap Base - Clear 24 lb." COMMENTS: This is my "go to" soap for most everything I make. It's super clear, easy to cut and the price is right.Please let's not run out. "I Won't Buy Any Other Base"
COMMENTS: I have tried many of the different bases, even the extra and crystal clear, and for me, this is the very BEST of the bunch! It is more than clear enough for embeds, is versatile enough for additives, melts quickly and firms up nicely with little shrinkage over time (all of this without being too hard or harsh!) AND THE PRICE IS UNBEATABLE!!!! I don't even bother buying anything else anymore. Rave customer reviews and still a low cost per bar equal a five star rating from this soapmaker! COMMENTS: This soap base is easy to work with and when melted it is water clear. Sets quickly with no additives and a bit longer with additives, yet produces a nice firm bar of soap. Does well with colors and oils. I love the lather and it seems to be a soap base that won't melt quickly. COMMENTS: i love the product! used it an hour ago to make m&p soap! COMMENTS: Good quality at a reasonable price. My customers can't tell the difference between this soap and the shea butter or others that are more costly. "I need to make 200 2oz melt and pour wedding favors, how much soap shall I buy? My soap will measure 3.5 x 2.5 x 1/4." Staff Answer You will need to purchase 400 ounces of soap. One 24 lb. block would give you 384 ounces. Adding a 2 lb. tray of soap would give you 416 ounces which is enough to fill your order. "I make two layer soaps, with a solid color on the bottom of the base, molded embed designs then topped with this clear soap (so you can see through to the embedded designs) and I'm finding that my colors are bleeding into the clear after a few weeks. What colors do you recommend to use in the colored soap that won't bleed into the clear? " Staff Answer Stay away from the Stained Glass Liquid Dyes as these will bleed. You can use micas, NuTones, pigments and ultramarines. Staff Answer If you look at the NuTone colors on our site, we state the measurement was 1 tsp. per pound of soap to achieve that shade. You may be using too much if your colors are bleeding. Also, clear soap will always achieve a brighter, darker color, especially with a mica powder. "Can I add DL Panthenol to this base or to soaps in general, I just got my 24lb block and I find it a little drying. I’ve never made soap before, but I love Pantenol in my other products. If so, what amount would you suggest I try for a 2 lb recipe? Thank you!" Staff Answer Since we do not carry this product, we cannot make any recommendations on adding this to our soap base. We do not recommend adding oils or butters as this can cut back on the lather but adding milk powders, hydrosols or botanical extracts work very nicely. "Can you tell me if your Propylene Glycol is plant or animal or chemical based." Staff Answer Our Propylene Glycol is petroleum based. "It states in overview that it is a coconut oil base, but none is listed in the ingredients. Does this one have coconut oil in it?" Staff Answer The Sodium Laureth Sulfate is derived from coconut oil. So on our ingredients, can we list coconut oil in place of sodium laureth sulfate? Staff Answer You need to list the ingredients as shown on the soap base. "Is this a vegetable glycerin or a animal glycerin?" Staff Answer The glycerin is vegetable based in all our soap bases. "Can additional oils, coconut, palm, olive, shea butter be added to this? How does one do that? How will this affect the colors?" Staff Answer Yes oils can be added but the total fluid additives including fragrance cannot be over 6%. The color will change based on the color of the oil. An opaque oil will make the soap base opaque and oils such as olive oil with a color will make your clear soap base that color. "What is the best way to melt MP soap? Can I put it in the microwave or should it be on the stove?" You can definitely use the microwave! I recommend cutting your pieces down small (it will decrease the time it takes to melt, and make it melt more evenly), cover with plastic wrap, and go 30 seconds at a time, stirring in between. Just be careful not to overheat as it can mess up the end results of your batch. I don’t like using the microwave for any soaps, it kills nutrients & could possibly separate your soap. Using a double boiler/stove could cause a sticky stove top if there’s any spills, the smell of burning soap & burns to you. I melt my soaps & butters in crock pots on the lowest setting. You can walk away from it and not worry about your product burning, if you come back every 5-10 minutes to stir & check on it. Also cutting the soap into small chunks helps speed up the melting process. The microwave works great for MP soap. We cube our bases so they melt quicker in the microwave. Typically 5 minutes (on a lower setting) for a 3 lb batch does the trick! We always melt our bases in the microwave. Just cut your blocks into smaller pieces and microwave on a low setting. Typically a 3 lb batch will melt down completely after 4 minutes on low. When using the microwave make sure not to let the soap boil. It can really ruin your batch. I also prefer melting mine in a crockpot. Seems to be so much easier then the microwave and does not get hot as fast. I have had no problems with sweating since I have change to the cropckpot method. You can also put it in a pot and melt on the stove top at a low setting. It takes longer than the microwave but you can do large quantities this way without chopping or over heating. We melt 12 pounds in a big pot at once on a level 3 on our electrical stove top. We have been melting soap this way for years and have never had a problem with burning or separation. Using the microwave and stovetop both work well. I personally like to use the microwave because I can dirty less dishes and it's faster, but you can use either method. Melting for 30 second bursts works well for me. Try not to boil the soap though because it smells really bad and seems not to hold scent very well after that. "What is the best way to cut a 24 pound block of MP soap?" I know many people use a cutter similar to that used for a cheese wheel - it looks like a handheld hacksaw but with a wire instead of a blade. Personally I use a serrated edge knife (which I don't necessarily advocate because when handling soap, EVERYTHING gets slippery) to cut out small chunks at a time. I score the block with the knife length, width, and height ways and then cut it down into 12 more manageable cubes. Staff Answer I like to use our standard soap slicer because the edge is not sharp. I cut in sections making a cut down and then a horizontal cut, chunks are usually around 4 x 5. It takes me about 15 minutes to cut an entire big block this way. I like to take time to cut the entire block and then store in the original bag. This way I just need to reach in and get amount needed during a soap making session. I agree with Debbie Mae. It's so easy to get the "grunt" work out of the way and just cube up the whole block. I slide my slicer down as far as it will go in (usually half the block) then cut inwards. I cube up the slab and repeat until the bag is fully cubed. So easy to keep the flow going when you're not constantly cubing up soap! Personally I suggest using the straight soap cutter sold on this site. It gives nice straight cuts and you don't have to worry about knives slipping. I usually cut at the corners and slice only halfway down. When all of that is used up, I just slice up the rest again by cutting the corners that are made. Also another tip would be just slice it up when you need to use it rather than using a lot of time slicing it all at once. A soap cutter or wire cheese slicer. If you use a knife you run the risk of hurting yourself or others if the knife slips on the slippery surface of the soap, also your hands could become slippery. I typically use the safe route and go with a cheese slicer or soap cutter. That way it helps prevent accidents. Many years ago I ordered what is called a 2 handle pizza cutter or cheese cutter. I am able to slice the block of soap into slices and then cube it up. I bought a 15" cheese knife; a straight blade with a handle on each side on ebay. There are different brands; you don't have to buy an expensive one. What a great tool! It cuts all the way through the block with no slipping, then cuts into cubes with ease. No more sore hands because of the double handles, and it saves so much time-love it! they are all hard to cut 'cold' but I just found that warming them to around 80 degrees makes it really easy to slice up. I left the carton in the sun on a shipping cart by accident for a few hours before opening and using and it was easy to hack apart. I don't know how sun-hot is too hot... but they were poured into that plastic so I guess they are safe in it. "I am having trouble unmolding, can I put this in the freezer to help release it?" With most molds, you shouldn't have much issue unmolding unless the soap hasn't cooled completely and is still tacky to the touch (which can be difficult to tell, as the innermost parts cool last). If you are using silicone molds, I find that if you pull the edges of the mold away in all directions first to loosen your soap, you can then flip the mold over and they should pop right out. Staff Answer A plastic mold filled with hardened soap can be placed the freezer for a short time. As the soap gets really cold it contracts. When it comes out of the freezer, the mold warms faster than the soap which allows the soap to more easily unmold. For stubburn soap, you can remove the mold from the freezer and run the back of the mold under very warm water. The soap will then fall right out. Do not freeze the soap and do not sit the mold close to the freezer blower as it can cause soap to sweat. I place my mold in the refrigerator just until it's cold. Then I remove it and use a warm blow dryer on the back for just a few seconds, enough to warm the plastic but not melt the soap. My soap pops right out! I do put soap in the freezer for 10-20 minutes depending on the size so it can harden quickly and unmold easily. It works great! You can but it runs the risk of your soaps sweating when they are removed and unmolded from the freezer. I've put molds in the freezer to unmold easier. I don't leave it very long and if it is being a real pain I use warm water and run it over the back of the mold. "What colorants or dyes are best to use with MP Soap?" "Can you add food coloring dye to soap? Or will it stain?" Staff Answer It depends on the color and if the FDA has approved the color for use in cosmetics, including skincare products. Some food colors may fade quickly in cosmetics. "I have previously ordered this in 2 pound trays and was very pleased with the clarity. I just ordered and received the 24 pound block, and it is cloudy. Is this normal?" Staff Answer Big blocks of soap are always going to look cloudy because they are so thick. When you make your usual bars of soap they will be very, very clear. I am sure you will be very pleased! This soap is cloudy when you get it, but the other day I made a monogram soap which involved really clear base. I was thrilled that the base was crystal clear! The soap turned out beautifully! "How is this base different from the probase clear? " Staff Answer This base has a lower level of surfactants than the Crafter's Choice Pro Base. This leads to a combination of creamy and big bubbles instead of all big bubbles. "is the melt and pour glycerin soap considered "vegan"?" Staff Answer Crafter's Choice Melt and Pour Soap Bases are all vegan EXCEPT those containing: Goat Milk (milk is produced by goats), Honey (honey is produced by bees) and Baby Buttermilk (buttermilk originates from milk produced by cows).